Wales had lost to France and beaten Italy in their opening two games of the campaign. Deon Smith was the hero as Wales secured a dramatic late victory over England in the U20s Six Nations. Kieran Wilkinson's early penalty separated the sides at the interval following a tight first half. Two Cai Evans penalties put Wales ahead before Rusiate Tuima's try, converted by Wilkinson, looked to have secured the win for England. England had a try disallowed before Smith crossed for a dramatic try in the closing seconds. 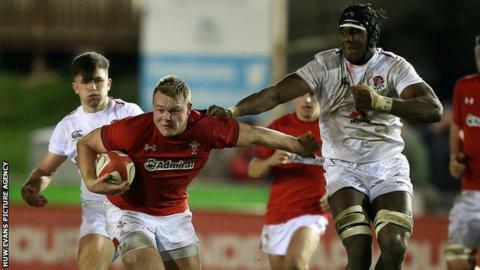 The victory in Colwyn Bay was was only the third time Wales had beaten England at Under-20 level. Both sides will resume their Six Nations campaigns on Friday, 8 March when Wales travel to face Scotland and England host Italy. Wales 20s: Ioan Davies (Cardiff Blues); Tomi Lewis (Scarlets), Max Llewellyn (Cardiff Blues), Aneurin Owen (Dragons), Dewi Cross (Ospreys); Cai Evans (Ospreys), Dafydd Buckland (Dragons); Rhys Davies (Ospreys), Dewi Lake (capt), Ben Warren (Cardiff Blues), Ed Scragg (Dragons), Teddy Williams (Cardiff Blues), Lennon Greggains (Dragons), Jac Morgan (Aberavon/Scarlets), Iestyn Rees (Scarlets). Replacements: Will Griffiths (Dragons), Tom Devine (Dragons), Kemsley Mathias (Scarlets), Max Ayling (Dragons), Ellis Thomas (Llanelli), Dan Babos (Dragons), Sam Costello (Leicester), Deon Smith (Dragons). England U20s: Josh Hodge (Newcastle Falcons); Ollie Sleightholme (Northampton Saints), Connor Doherty (Sale Sharks), Tom de Glanville (Bath Rugby), Ollie Hassell-Collins (London Irish); Kieran Wilkinson (Sale Sharks), Ollie Fox (Yorkshire Carnegie); Olly Adkins (Gloucester), Nic Dolly (Sale Sharks), Alfie Petch (Exeter Chiefs), Joel Kpoku (Saracens), Alex Coles (Northampton Saints), Richard Capstick (Exeter Chiefs), Aaron Hinkley (Gloucester), Tom Willis (Wasps). Replacements: Samson Ma'asi (Northampton Saints), Kai Owen (Worcester Warriors), Jack Bartlett (Gloucester Rugby), James Scott (Worcester Warriors), Rusiate Tuima (Exeter Chiefs), Sam Maunder (Exeter Chiefs), Manu Vunipola (Saracens), Jack Reeves (Gloucester).